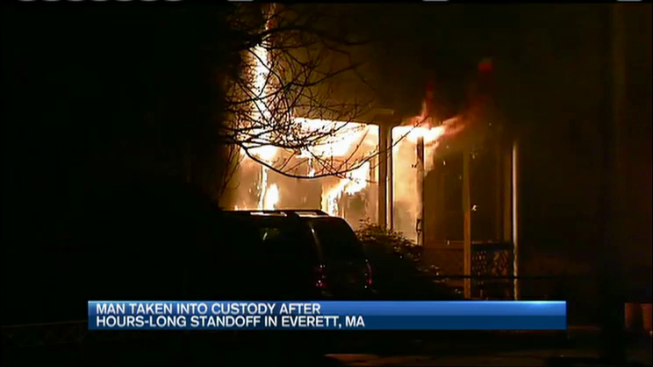 A nearly six-hour standoff between police in Everett, Massachusetts, and a barricaded man ended with a High Street home in flames Friday. Neighbors said the situation started around noon, when they heard what they believed to be gunshots coming from the inside of the home. Everett Police raced to the scene. Upon their arrival, they said 53-year-old Mark Levoine, the homeowner, made threatening comments before barricading himself inside. Officers said they tried to communicate with the man for almost six hours, but Levoine repeatedly refused. Eventually, tear gas canisters were launched into his home. Around 5:30 p.m., police said Levoine came to the door armed with three firearms as flames began to grow behind him. Officers were then able to arrest him. No one was injured in the incident, but a neighbor was taken into an ambulance as a precaution. Police say they don't know what caused Levoine to become hostile or what started the fire. More details will emerge as the Middlesex District Attorney's Office investigates this incident.